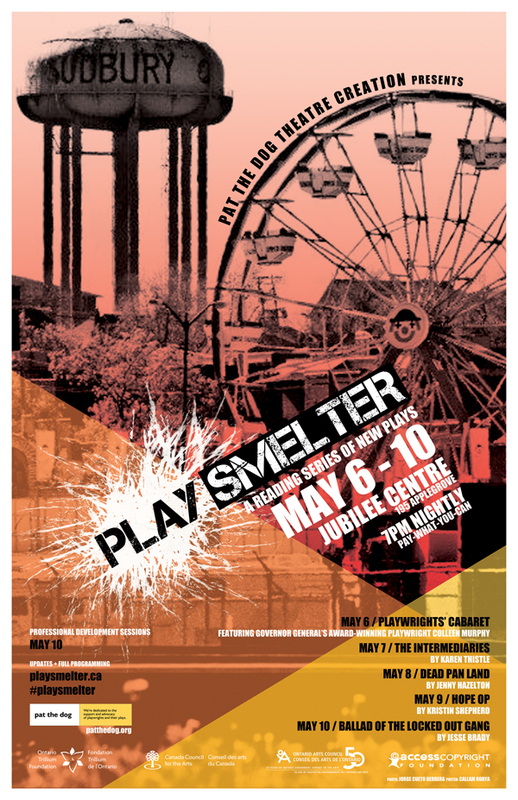 From May 6– 10, four new plays will be given their first readings in front of a live audience as part of PlaySmelter, at the Jubilee Centre. Governor General’s Award-winning playwright Colleen Murphy will join local writers Karen Thistle, Jenny Hazelton, Jesse Brady and North Bay native Kristin Shepherd in this initiative, produced by Pat the Dog Theatre Creation. The series, now in its second year, offers the rare opportunity for an audience to get their hands dirty by participating in the development of these important works-in-progress. All readings feature performances by local actors. Tuesday, May 6th – Festival Kick-off – Playwrights’ Cabaret, a reading by Governor General’s Award-winning playwright Colleen Murphy. Wednesday, May 7th – The Intermediaries by Karen Thistle. A young woman, facing the pressures of high school and growing pains, is entrusted with the care of the magical beings that inhabit Bell Park. Thursday, May 8th – Dead Pan Land by Jenny Hazelton. Two people are drawn magnetically together. A riveting piece of physical theatre about the adventure of breaking free from the mundane day-to-day routine. Friday, May 9th – Hope Op by Kristin Shepherd. A hilarious and poignant look at ageing. In their daily yoga class, four women plan a hostile takeover of a supermarket. Saturday, May 10th – The Ballad of the Locked Out Gang by Jesse Brady. Mired in a long and bitter strike, a group of miners plot a daring gold heist. All readings begin at 7:00pm at the Jubilee Centre (195 Applegrove). Admission to each evening is Pay-What-You-Can (suggested minimum $10). Each piece will be followed by a discussion, in which the audience can help take these plays to the next step in their development.